The Schipperke, or "little black devil" as he is often affectionately called, is a faithful little watchdog who is one of the hardiest of all small dogs, the Schipperke is equally at home running through the fields in the country or lying in a small city apartment. Essentially the Schipperke is a guard dog, completely devoted to the family and, by nature, suspicious of all strangers. The breed possesses a very keen sense of smell and has been used with good sucess in the hunting of rabbits and raccoons. The Schipperke origin goes back centuries to the flemish provinces of Belgium. The breed was developed from the native black sheepdog of Belgium, this is not the Belgian Sheepdog that we know today, but a smaller sheepherding dog now believed to be extinct. 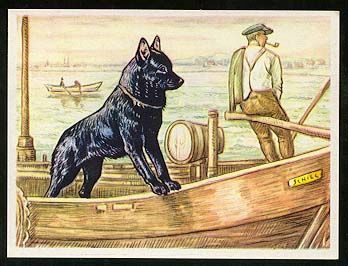 From the very beginning the Schipperke served as a companiion and guard dog for the trademen and barge captains of the provinces. The Schipperke acquired its name, a flemish one meaning "little captain," because it was known primarily for its services on the barges. The first registration of a Schipperke as a purrebred dog was in Belgium in 1882. In 1885 Queen Marie Henriette of Belgium acquired a Schipperke as a pet, making the breed tremendously fashionable. The demand for the small black dogs quickly spread to England. The first Schipperke came to New Zealand in 1907. Schipperkes, like all other purebreds, are measured against a breed standard of perfection, a written description of what the ideal specimen should look like. However these standards vary from country to country and registry to registry. A small cobby animal, with sharp expression, intensely lively, presenting the appearance of being always on the alert. Head foxy in type, skull not round, but fairly broad, flat and with little stop. The muzzle should be moderate in length, fine but not weak, should be well-filled out under the eyes. Nose black and small. Dark brown, small, more oval than round and not full; bright and full of expression. Sharp, of moderate length, not too broad at the base, tapering to a point. Carried stiffly erect and strong enough not to be bent other than lengthways. Strong and full, rather short set, broad on the shoulders, and slightly arched. Shoulders muscular and sloping. Legs perfectly straight, well under the body, with bone in proportion to the body. Fine compared to the foreparts, muscular and well-developed thighs; tail-less rump well rounded. Legs strong, muscular, hocks well let down. Should be small, cat-like, and standing well on the toes. Abundant, dense and harsh, smooth on the head, ears and legs, lying close on the back and sides, but erect and thick round the neck, forming a mane and frill and with a good cullotte on the back of the thighs. Should be black but other whole colours are permissible. Weight about 5.4 to 7.3 kg (12-16 lbs).